What if your alarm clock set time would change depending on the weather? * Be first in the slopes on a great day or stay in bed when the weather is bad. * Get up in time to watch the sunset or enjoy a sleep-in if the sky is overcast. * Windy? Get out your surfboard. Calm? Stay in bed. * Windy? Stay in bed. Calm? Go for a spin in your paraglider. * Get up early to beat the traffic to the beach or the park on a beautiful but enjoy a well-deserved sleep-in on those rainy days. 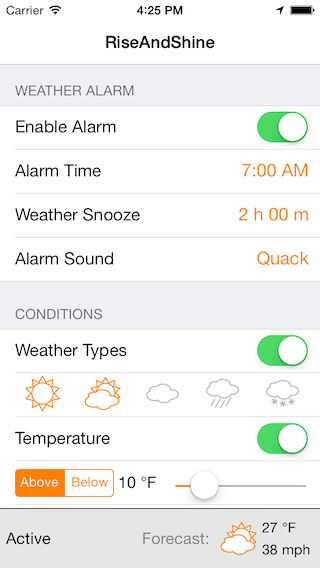 RiseAndShine lets you specify weather conditions for your alarm. If the conditions are met, the alarm fires on the set time. If not, the alarm is weather snoozed. The weather snooze period is customizable from 1 min - 24 hours and if the weather forecast should change during this period so that it matches the selected conditions, RiseAndShine will wake you up. If not, the alarm will go off at the end of the weather snooze period. The current status of the alarm and the most recent forecast for the alarm time is always visible in a status bar at the bottom of the screen. RiseAndShine updates the weather forecast in the background during the night even if the phone is locked and should you travel to another location after setting the alarm, the forecast for your new location will be automatically downloaded and the alarm status updated. Since RiseAndShine uses notifications to sound the alarm there is no need to keep the app in the foreground. Just set the alarm, close the app and you're done. 99mac reviews RiseAndShine (in Swedish). Screenshot showing the main screen of the app. This is really (almost) all there is to it. We've opted to keep the app clean and simple to make it quick and easy to use. For more screenshots please click the AppStore link on the right hand side. RiseAndShine lets you set an alarm with weather conditions. Available for iOS7, priced in the $1 range. November 28:th, 2013: RiseAndShine 1.1 with a better sound picker and more alarm sounds is released. September 22:th, 2013: RiseAndShine 1.0 for iOS7 is now available at the AppStore. September 13:th, 2013: First version of app submitted for review! RiseAndShine is developed in collaboration between Espling IT and LugAB. If you have any comments, suggestions, or problems, do not hesitate to contact us at riseandshine@mackaroni.se.